A TD bank machine is being installed at Creemore Foodland. TD Bank said the bank machine at the shuttered bank will be removed on May 13. Until that time, both machines will be operational. The new bank machine is “full service” but because it is located inside the store (close to the main entrance) it will be accessible during regular business hours only. Foodland is open daily from 8 a.m. to 8 p.m. daily with the exception of Sunday when the store is open from 8 p.m. to 7 p.m.
Crews vacuum a hole for a new utility pole at the corner of Mill and Elizabeth streets Wednesday after a food delivery truck, making its regular rounds in Creemore that morning, snagged overhead wires, breaking the pole. Epcor had a new pole delivered from Collingwood and power was cut for a time in the afternoon. Creemore 100 Mile Store founders Sandra Lackie (from left) and Jackie Durnford with store manager Neil Connolly and new owners Linda de Winter and Christian Klockl-Greimel. Gateway Casinos & Entertainment announced April 4 that it proposes to build a new casino on a 7.5-acre parcel of land adjacent to the Mosley St. roundabout in the west end of Wasaga Beach. The new casino will have slots and table games, pending necessary government approvals and completion of the land transaction. Construction is expected to begin this spring, once provincial and municipal approvals are obtained. In the coming weeks, Gateway will announce more details on the size and scope of the development including new employment opportunities, food and beverage offerings and the investment in the local economy for the new build. “We are very pleased to announce that we expect to soon be able to move forward with our plans to build an exciting new casino and entertainment destination in the Town of Wasaga Beach. We look forward to receiving all the necessary provincial and municipal approvals and concluding the land transaction so we can start construction as quickly as possible,” said Keith Andrews, Senior Vice President and Managing Director for Gateway Casinos Ontario. Clearview Township opted out as a willing host early in the process of choosing a location for the casino. •	Easter Egg Shellebration for children of all ages. Egg hunt & Easter party at Nottawasaga & Creemore Public School at 7 p.m. Hosted by Clearview Community Church. Free. Call 705428-6543 for more info. •	Creemore Curling Club AGM Annual Wind-up Banquet at Creemore Legion. 6 p.m. start - Social Time. Annual General Meeting at at 6:30 p.m.
(open to all). Dinner at 7 p.m. Dinner Tickets ($25) can be purchased from a member of the executive. For info call Adam Verstegen at 705-607-2326. Open to the public. •	Clearview Firefighters Food Drive at Creemore Foodland from 9 a.m. to 1 p.m.
• Palm Sunday Church Services on page 5. •	Centennial United Church, 234 William Street, Stayner, is presenting country and gospel singer Naomi Bristow. Two-time yodeler of the year, Havelock Jamboree fan choice award winner, with local ties to the area. 2 p.m. Freewill offering gratefully accepted. For more information, call the church at 705-428-3711. • AA Creemore Tuesday Night Group at St. Luke's Anglican Church, Caroline Street West. Those with problems with alcohol only please. • Home for Life weekly seniors coffee social in Creemore on Wednesdays from 2 p.m. to 4 p.m. at Affairs Café. Visit, chat, play cards. • Creemore Horticultural Society April Meeting at St. Luke’s Anglican Church Hall, 22 Caroline St. W. at 7:30 p.m. Speaker: Miriam Goldberger of Wildflower Farm on “The Real History of the Lawn in North America.” Books and seeds available for purchase. Snacks and social time following the speaker. Visitors are always welcome. • Easter Church Services on page 5. • Creemore Farmers’ Easter Market at Station on the Green from 9 a.m. to 1 p.m. www. creemorefarmersmarket.ca for more info. •	Meraki Artisan Spring Market at Nottawa Hall, 4129 Cty. Rd. 124 from 10 a.m. to 4 p.m. Celebrate Spring with a curated collection of incredibly talented local Artisans, Makers & Creators. Email ssmarketplace@hotmail.com for more info. •	The Easter Bunny is coming to Creemore! Meet the Easter Bunny on Mill Street from 11 a.m. to 2 p.m. Starting at 11 a.m. there will be crafts and activities along Mill Street. Meet at the fountain at 1 p.m. for an egg hunt. For more info call darcique at 705-795-5733. •	Community Easter Egg Hunt at the Stayner Campground from 9 a.m. to noon. Join us for lots of family fun. Egg Hunting, Games, Children’s activities, Meet the Bunny, Face Painting and visit Clearview firefighters, too. There is also a great pancake breakfast ($2.50 Children, $5 Adults) all (240 Scott Street, Stayner). For more info or to volunteer contact Kayla at 705-4283733 of gerriordutka@rogers.com. •	Stayner Garden Club Meeting at Centennial United Church, 234 William Street, Stayner. Social time at 7 p.m. Speaker at 7:30 p.m. Xeriscaping with Michael Wheatcroft. Everyone welcome. •	Dunedin’s Annual Fisherman’s Breakfast and Bake Sale from 7 to 10:30 a.m. at Dunedin Village Hall. This event has marked the opening of fishing season for over 30 years, and attracts hundreds of people for its great home-cooked breakfast and spectacular baked good. •	Sunnidale Corners Hall Spring Euchre Kick Off Tournament - Progressive Euchre. 7 p.m. start. Doors open at 6:30 p.m. $12 per person. Limited to 60 players. Food, great prizes, special draws. Call Marianne at 705-428-0223. •	Ray’s Place Annual General Meeting at Creemore Legion at 2 p.m. All welcome. •	Retired Women Teachers of Ontario Blue Mountain welcomes newly retired or previously retired women teachers to share the fellowship offered by our organization. Registration at 11 a.m. at St. John’s United Church, Creemore. For more info call Lois at 705-428-2880 or Pat at 705-466-6505. •	Creemore Horticultural Society is offering a free “Veggie Gardening 101” class to the public from 7 to 8 p.m. at St. Luke’s Anglican Church Hall, 22 Caroline Street West in Creemore. From novice to experienced gardeners. All ages are welcome to attend (under age 15 must be accompanied by an adult). Advance registration is required. Email CreemoreHort@gmail. com or call Judi at 1-519-925-5368. • Duntroon Hall’s Know It All Ball. Doors open at 6:30 p.m. Trivia begins at 7 p.m. Bring your own snacks and brains. For info call 705-888-9514 or visit www.theduntroonhall.com. •	Centennial United Church Annual Fish Dinner from 4:30 to 7 p.m. Fillets of rainbow trout caught right in Georgian Bay with all the trimmings and homemade pies for dessert. Entertainment while you wait. Take-out & gluten-free available. Tickets at door. Adults $17, children 6-12 $8, 5 & under free. •	Choral Works presents a Concert at First Presbyterian Church, 200 Maple Street, Collingwood, at 7:30 p.m. Under the direction of Brian Rae. Special guests: Midland Children’s Community Choir and Vivo. Tickets $30, $35 at door, youth 16 and under $15, available at www. choralworks.ca or call Heather at 705-888-4454.
community,” said Sullivan. “I like to be able to serve God in community.” She said she looks to discover spiritual depth and richness, and provide a community to explore social activism, identifying common goals or “looking for things that cause all the boats to rise.” In keeping with her love of nature, Sullivan said one of her ideas is to offer Forest Church which takes worship to the outdoors. “It’s about the idea of getting out and breathing, being out in nature and the mindful spiritual practice that goes along with it,” she said, adding it’s often what people do while out for a hike. “Doing it in community makes for a richer experience of the divine.” St. John’s United has some special services coming up. On Palm Sunday, April 14, the Passion Play will be performed by the children of the congregations in silhouette (at 9:45 a.m. in New Lowell and 11 a.m. in Creemore). There will be a joint service on Good Friday, April 19, at 11 a.m. in New Lowell. On Easter Sunday, there will be a Sunrise Service at the Eagle Chapel at 7 a.m., followed by an Easter breakfast in Creemore at 8 a.m. Sunday services will be at 9:45 a.m. in New Lowell and at 11 a.m. in Creemore. grateful. “We don’t plan any changes,” said Klockl-Greimel, except for some website enhancements. “We like the concept as it is. The idea is just great.” He and de Winter say the 100-mile concept represents everything they find frustrating about traditional grocery stores. “The weird part is that products are cheaper even though they come from far away and it makes no sense,” said de Winter. “It’s important to support the local community and it adds to its charm.” Creemore 100 Mile Store carries a variety of goods – including produce, meat, dry goods and prepared foods – sourced from small to medium sized area growers and producers. “The nice thing is that you have a direct line to the farmer to get information about a product,” said Lackie. Although the new owners will be working from afar they do plan to visit often and relocate to the village at some point in the future. At home in Switzerland they both work in intralogistics. Klockl-Greimel is a sales director for a company that optimizes and manages the logistical flow of goods of warehouses and distribution centres through automation. De Winter is a draftsperson, designing and drawing things like mezzanines and mobile racking systems (in 2D and 3D) for effective storage in warehouses. Golf; stands for Gentlemen Only Ladies Forbidden, well we know how long that rule lasted. I am not a golfer; in fact I have only been golfing twice in my entire life. The first time was about a hundred Cat FLACK years ago on the course at Base Borden. I was golfing with a golf maniac; let’s just say that I had to go through therapy to get over the trauma of that episode. The second time was at Highlands golf course about twenty odd years ago. I was invited to give it a whirl with my friends (I will only use initials to protect the innocence of all involved) S., E., T. and of course the CEO. It was a lovely day and as was the custom twenty odd years ago, a little liquid refreshment was the rigor of the day. First mistake. We proceeded to rent a golf cart as none of us seemed to be in the walking-for-miles mood. Second mistake. Off we went, all piled into the cart only to be accosted by the golf course security to be told that golf carts were meant for only two passengers not five. We obliged the golf patrol officer by asking E., T. and the CEO to remove themselves from the cart, they could walk, and S. and I would take over the driving. Somehow S. managed to fall out of the cart, can’t quite remember how that happened... Blame it on the liquid refreshment. We managed to get our balls close enough to the hole with the flag in it that it necessitated someone to go and hold the pole with the flag on it out of the hole, in case by some miracle someone got a hole in one (insert riotous laughter here). I volunteered as I had been the lead tee off person and had not located my ball yet. I stood a respectable distance from the hole holding the flag and watched as E. fired up, hit the ball with tremendous force and followed the arc of the little white dimpled sphere when Kaboom, nailed me right in the leg. I know all too well what the phrase “deer in the highlights, frozen with fear” means. I fell to the ground, not writhing in pain, but rolling with laughter. Third mistake. Let’s just say that the leg being hit with a fast moving ball was somehow attached to the nerve leading to my bladder, and I had to go home and change my pants. I can write about it now because I am old, but I was mortified at the time. S. knew what had happened and lent me her sweater to tie around my waist. The game was over for me. I think I had made it as far as the first hole. Golf does not beckon me to try again. I have found that a robust game of Cricket is so much more entertaining and safer; Lawn Bolles is up there too. Whatever your spring game is, get out and enjoy it. Mail is unloaded from Train 391 at Duntroon into Model A Ford mail carriers at the end of the station in 1954. The photo is copied from a 1979 edition of the Stayner Sun, submitted by Claudia Huston. The Creemore Echo is independently owned and operated. math scores have improved over a six-year period except for Ontario. This same article also states decreasing literacy skills in Ontario. Something has to change. Going back to basics sounds like a reasonable option. All my math teachers insist everyone should pay for a tutor since math is “so hard.” Guess what, not everyone can afford tutors. Hey, I don’t know, but maybe teachers can do their jobs and adequately teach their students without always saying, “Get a tutor.” I mean, it’s your job! For 15 years, a Liberal Ontario government has caved to the funding and salary demands of the teachers’ union in exchange for that union buying expensive ads aligning with that government’s agenda. Doesn’t this recent provincial election represent the grade that taxpayers have given teachers for the way their money has been spent? And what did their lobbying activity lead to? From first hand experience I can say the classroom is not an open forum for discussion. There are plenty of political discussions in class but they are slanted. Real opinion or thought diversity is not allowed. If a teacher says something, kids are not equipped or taught to question it. “All in all, you’re just another brick in the wall.” Ontario teachers have successfully concealed from my generation the need to pursue truth. It amounts to indoctrination of children into their ideology. Case in point, letting children walk out of class as long as they protest for the teacher’s agenda. It was sickening to see children used as tools for propagandizing. I have not met anybody around this area that doesn’t think that teachers are more than adequately compensated for the job they do. Surely teachers have an inkling of one significant reason why the parents of the children they currently teach cede to their every demand. Don’t you think when you hold the academic destiny of us children in your hands it is exploitative to tell our parents to come out and protest for you? “Hey, teacher! Leave them kids alone.” Yael Inglis, Creemore. 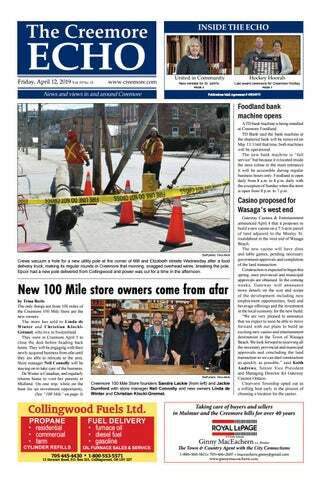 The Creemore Echo is published every Friday and distributed free locally. Editorial and advertising material deadline is Tuesday at 5 p.m. To receive a weekly copy of The Creemore Echo by mail outside of the circulation area or email version please contact us at info@creemore.com. Mail, email and voluntary subscriptions: $52 plus hst. Publication Agreement # 40024973 Please return undeliverable Canadian mail to address below. • Palm/Passion Sunday. Service at New Lowell United Church at 9:45 a.m. and at St. John's United, Creemore, at 11 a.m. • Palm Sunday Service at Knox Presbyterian Church, Dunedin, at 10 a.m. • Palm Sunday Service at Holy Trinity Clearview, Duntroon at 10 a.m. • Palm Sunday Intergenerational/Eucharist at Church of the Good Shepherd, 219 Scott Street, Stayner, at 10:30 a.m. • Service at Salvation Army Hope Acres at 10:45 a.m. 998614 Mulmur Tos TL. • Palm Sunday Service at St. Patrick's Catholic, Stayner. Mass at 11 a.m. • Palm Sunday Service at Clearview Community Church, Creemore, at Station on the Green at 11 a.m. • Palm Sunday Service at St. Luke's Anglican Church at 11:15 a.m.
• Mass at St. Patrick's Catholic, Stayner, at 10 a.m.
• Remembering the Last Supper at St. Luke’s Anglican Church at 10 a.m. • St. Andrew’s Maple Cross Presbyterian Church, Creemore will be open between 6 and 10 p.m. for a Silent Vigil. Pick the time of your choice & give Jesus one hour. • Holy Thursday Service at Holy Trinity Clearview, Duntroon, at 7 p.m. with Eucharist & washing of the feet. • Mass of the Last Supper at St. Patrick’s Catholic, Stayner, at 7 p.m. • Maundy Thursday Service at Church of the Good Shepherd, 219 Scott Street, Stayner, at 7 p.m.
• Good Friday Service at Knox Presbyterian Church, Dunedin, at 10 a.m. • Good Friday Service at Holy Trinity Clearview, Duntroon, at 11 a.m. The Solemn Liturgy of Good Friday. • Good Friday Service at Sixth Line Church at 10 a.m. 1152 Conc 6 N. • Good Friday Service at Salvation Army Hope Acres at 10:45 a.m. 998614 Mulmur Tos TL. • Good Friday Service at New Lowell United Church at 11 a.m. • Good Friday Service at St. Andrew’s Maple Cross Presbyterian at 11 a.m. • Good Friday Service at St. Luke’s Anglican Church at 11 a.m. Remembering the day of our Lord's Crucifixion. • Emmanuel Presbyterian Church open from 1 to 9 p.m. for self-directed Stations of the Cross. 3521 Cty Rd 124, Nottawa. • The Stations of the Cross: a liturgy of remembrance at Holy Trinity Clearview, Duntroon, at 2 p.m. • Good Friday Service at Church of the Good Shepherd, 219 Scott Street, Stayner, at 3 p.m. • Good Friday Service at St. Patrick’s Catholic, Stayner, at 3 p.m. Day of Fasting & Abstinence. • Good Friday Service at Clearview Community Church, Stayner at 7 p.m. 1070 Cty Rd 42. • Emmanuel Presbyterian Church open from noon to evening for self-directed Stations of the Cross. 3521 Cty Rd 124, Nottawa. • Emmanuel Presbyterian Church all night vigil "Come & Keep Watch". 3521 Cty Rd 124, Nottawa. A great deal of activity marked the Baptists of the early twentieth century. A Young People’s Union was formed. Entertainments were held. The little ones from the Mission Band were reported as excelling at recitations, dialogues and music. A garden party was held on the Baptist lawns one July. A large quantity of delicious edibles was enjoyed by the participants. The nearby tennis court was very popular as was the music provided by Lochie Coleman with his pipes and accompanying band. On another occasion an evangelistic band of five young men from McMaster University attracted such a crowd that many were not able to get in. The addressed were “bright, brief and interesting and the music of the quartette and soloists were inspiring.” On the night before He died, Jesus was in the Garden of Gethsemane praying. Jesus expressed disappointment in His disciples, saying, “Could you not watch with me one hour?” On Thursday, April 18, St. Andrew’s Maple Cross Presbyterian Church, Creemore will be open between 6 p.m. and 10 p.m. for Silent Vigil. Pick the time of your choice and give to Jesus one hour. • Sunrise Service at Emmanuel Presbyterian Church at 6:27 a.m. 3521 Cty Rd 124, Nottawa. • Easter Sunrise Service at the Eagle Chapel, 3627 5th Line at 7 a.m. (southwest of Creemore heading out Caroline Street West. Call the church if you need directions at 705-466-2200.) • Following the service, Easter Breakfast at St. John’s United Church Hall at 8 a.m. • Communion Service at Mansfield Prebyterian Church at 9:30 a.m. • United Church of Canada Services – New Lowell United Church at 9:45 a.m. & St. John’s United, Creemore at 11 a.m. • Easter Sunday Service at Sixth Line Church at 10 a.m. 1152 Conc 6 N. • Easter Service at Holy Trinity Clearview, Duntroon, at 10 a.m. Resurrection Sunday. • Service at St. Andrew’s Maple Cross Presbyterian Church, Creemore, at 10 a.m. • Easter Sunday Service at Knox Presbyterian Church, Dunedin, at 10 a.m. Where can I find God? • Easter Service at Emmanuel Presbyterian Church, Nottawa, at 10:30 a.m. 3521 Cty Rd 124, Nottawa. • Easter Sunday Eucharist at Church of the Good Shepherd, 219 Scott Street, Stayner, at 10:30 a.m. Sunday School. • Service at Salvation Army Hope Acres at 10:45 a.m. 998614 Mulmur Tos TL. • Easter Worship Service at Clearview Community Church-Creemore at Station on the Green, Creemore at 11 a.m. Full children’s program 0-12 years old. • Service at Creemore Baptist Church at 11 a.m. • Easter Sunday Mass at St. Patrick’s Catholic, Stayner, at 11 a.m. • Easter Sunday Service at St. Luke’s Anglican Church at 11:15 a.m. Our Lord is risen! Creemore Minor Hockey held its annual award ceremony April 7: The Bob Pickering Volunteer of the year award is presented by Dana Edwards (second from left) to the Creemore Minor Hockey executive: Donna Harper (from left), Marc Dupuis, Alana McCleary, Brian McIntyre, Kevin Bloemendal and Tisyn Milne. Absent: Chad North, Josh Symons, Susan Michalchuk, Paul Nicholson, Nicole Patton and Robert Kinghan. The Reg Westbrooke Memorial award recognizing Years of Dedication to Creemore Minor Hockey is presented to long-time Creemore Minor Hockey president Donna Harper, by Brian McIntyre. The PeeWee Fair Play award is presented by Donna Harper (from right) to Marshall Metheral and Jack Walsh. The Referee Award is presented by Donna Harper (from left) to Brody Carruthers, Justin Morby and John Underhill (absent) . The Bryan Trott For the Love of the Game award is presented by Brent Trott and Jordan Trott to Wyatt McCleary. Left: The Bob Patton trophy for the Most Improved Atom Player is presented by Marc Dupuis to Victoria Gillespie and Caleb Lightheart. The William West coaching staff of the year award is presented by Brian McIntyre (from left) to the Tyke team coaching staff Shawn Gillespie, Jamie Duits, Scott Weldon and John Patterson. The Ken Morby award for the most defensive Bantam player, went to Ty Hogben (absent). Dove Tail hand hewn oak log house originally from the Ottawa Valley. Open concept w/ beamed ceilings & wide plank pine floors. Nestled on a rare 55 acres of rolling land with views over surrounding countryside, mixed varieties of trees, tennis court & strong spring for possible pond site. Located in a most sought after area close to the Village of Creemore, Devil’s Glen Country Club & the prestigious Mad River Golf Course. Asking $1,590,000. This unique and rare building built in 2004 is an opportunity to own a substantial commercial building in Creemore. Approximately 4,700 sq ft. and built to the highest standard. 3,000 sq ft, 3 bedroom luxury apartment with elevator. The street level commercial area is approximately 1,700 sq ft and was built as the Mad and Noisy River Art Gallery and is currently under lease. Custom built by the renowned Architect Micheal Clifford who designed the Manulife Centre at Bloor and Bay. BUILDING ONLY Asking $1,295,000. Communications are available in alternative formats upon request. Mulmur Community Events Committee hosted Maple Madness, its first event of 2019, at 4M Maple Farm, serving up pancakes and sausages to over 300 people. It was a beautiful day to check out the sugar shack and take a stroll through the sugar bush. EMPLOYMENT OPPORTUNITY School Crossing Guard – Nottawa Location Permanent part-time and School Crossing Guards – Casual Relief, various locations Clearview Township is seeking 1 part-time permanent Crossing Guard at the Nottawa school crossing as well as Casual Relief Crossing Guards to work in various locations within Clearview Township to begin as soon as possible. Enjoy a light work schedule while earning some extra income. Clearview offers full and compensable training to all employees including on-line accessibility and safety training, hands-on and on-the-job training as well as a new employee orientation. Employees are paid their hourly rate of pay for participating in the training. Responsibilities -	To safely assist children crossing the street, to and from school. -	To be available Monday to Friday during the school year. Qualifications and Abilities required -	Must be physically fit. -	Able to work outside during adverse weather conditions. -	Able to communicate with and direct children in a clear manner. -	Must be able to provide a clean police background and vulnerable person’s check. -	Possess 20/20 vision (with corrective lenses if needed). -	Must have reliable transportation to crossing location. Wage:	$18.54 per hour plus 4% vacation pay. Training:	All required training and crossing guard apparel is provided by Clearview Township Note: The preferred candidate must be willing to provide consent for the Township to conduct a criminal background and vulnerable sector check prior to finalizing an employment offer. Interested candidates are invited to forward their resume and covering letter quoting job # 2019-014 to Human Resources by April 26, 2019 to:hr@clearview.ca We thank all applicants for their interest; however only those applicants selected for an interview will be contacted. No phone calls please. The Township of Clearview is an equal opportunity employer. Easter Egg Shellebration Clearview Community Church is hosting an Easter Egg Shellebration for children of all ages on April 12. There will be a free egg hunt and Easter party at Nottawasaga and Creemore Public School at 7 p.m. For more information, call 705-4286543. Learn about Hospice Georgian Triangle Anyone interested in learning about Hospice Georgian Triangle – what they do, who they are, how to help out – is encouraged to attend a presentation at First Baptist Church on May 2, at 1:15 p.m. Refreshments will be served after the presentation. First Baptist Church is located at 205 Oak St. in Stayner. Honeywood Nordoffs juvenile rep team won the all Ontario championships on home ice April 2 clinching Game 6 versus the Cayuga Stars 3-2 in overtime. Back row: Brandon Way, Danny Patton, Ryan Michalchuk, Darren Taylor, Stephen Falls, Trent Downey, Dakota Prentice and Evan March. Middle Row: Lana Cowan (Manager), Kayden Morley, James Shaw (Trainer), Jackson Nasato, Austin Hamilton, Hayden Verstegen, Donny Patton, Ethan England (Coach), Zack Johnston and Jackson Metheral. Front Row: Charlie Ardis, Hazen Mercer, Jadon Hunt, Gavin Gaudreault, Ryan Elo (Assistant Coach), Scott Decker and Jack Millsap. April 4 Potluck is at noon on April 18. Come join us for a delicious lunch. A few more have returned from the sunny south. 50/50: John van Voorst, Ron Laing, Peter Gubbels, Russell Ferguson, Irma Flack. Moon shots: Mary Bouchard, Jim Rigney, Alinda Bishop, John van Voorst. Winners: Barb Pilon, 293; John van Voorst, 277; Peter Gubbels, 273; Carol Tymchuk, 267. Low: Phyllis Seed, 125. Lucky chair: Morris Tymchuk. from early September until early April. This is a fun (non-competitive) league. time in yourpick-up busy schedule for automotive •Finding Convenient and drop-off servicemaintenance and repair can be a has- Whether a beginner or seasoned dart AtGuaranteed the same time, missing regular oil changes can take their toll on your car and lead player, all are welcome, and there is •sle. with 1foryear parts and labour Finding time in yourrepairs busy schedule automotive maintenance and repair can be a hasto a much bigger problem if left unattended. For that reason, I'm proud to offer a pick-up no need to be a Legion member. The Warranty sle. At the same time, missing regular oil changes can take their toll on your car and lead winning prizes go to: drop-off service that lets you do what you need to do while I take care of your car •and Estimates before any repairs are started to a much biggerprovided problem if left unattended. For that reason, I'm proud to offer a pick-up Winning Team Season 1 - Michael and truck issues. By simply calling up and scheduling a time, I'll come to pick up your ve• and drop-off Easy invoice payment online or at your door with Loranger, Barb Cudmore, Steve serviceorthat letsand youbring do what youtoneed do while I take care of or your car has hicle at your home work it back youto once the maintenance repair debit/credit mobile payment terminal and truck issues. You Bycard simply calling up and scheduling a time, I'llwith comefriends to pickor updrop-off your ve-your Wheelans, Val Nordstrom; been completed. no longer have to try to schedule rides Winning Team Season 2 - Marty •car Full Service -orNo need to goitfree anywhere else hicle at your home work and bring back to youpickup once for the or repair has during your lunch break, with my vehicle andmaintenance delivery service, auto Beelen, Barb Cudmore, Steve auto repair needs maintenance always your schedule. beenyour completed. Youfits no into longer have to try to schedule rides with friends or drop-off your car during your lunch break, with my free vehicle pickup and delivery service, auto maintenance always fits into your schedule. Most Double in’s, Men - Michael Loranger - 29, Women Emma Noonan - 23; Most Double out’s, Men - Jim Falls - 43, Women - Sharon Buchanan - 26 Most Bulls, Men - Rob Behe - 10, Women - Barb Cudmore - 7; High Score, Men - Marty Beelen 148, Women - Sharon Buchanan - 134 High Finish, Men - Jim Falls - 85, Women - Marie Blohm - 58. You’ll get a Warm Welcome & a Cold Beer! Finding time in your busy schedule for automotive maintenance and repair can be a has- Visit our retail emporium for a fine selection of beer wear, glassware and of course, our award winning beer. sle. At the same time, missing regular oil changes can take their toll on your car and lead to a much bigger leftappointment unattended. For that reason, I'm proud to offer a pick-up Call today for aproblem quoteifor 705-466-9950 and drop-off service that lets you do what you need to do while I take care of your car Store Hours: Mon to Sat - 10am to 6pm Service@AutoSolve.ca | www.AutoSolve.ca and truck issues. By simply calling up and scheduling a time, I'll come to pick up your ve- Sun - 11am to 5pm Call today for a quote or appointment 705-466-9950 hicle at your home or work and bring it back to you once the maintenance or repair has been completed. You no longer have to try to schedule rides with friends or drop-off your www.creemoresprings.com Service@AutoSolve.ca | www.AutoSolve.ca car during your lunch break, with my free vehicle pickup and delivery service, auto maintenance always fits into your schedule. Repairs to all makes of cars and light trucks! Peace Valley Ranch Grass-fed BEEF is hormone free and locally raised. Order a Side or Split Side to fill your freezer to feed your family or share with friends. Orders and deposits for our grass-fed beef must be received by May 1st with the balance due upon delivery. $4.50/lb. We are now taking orders for 2019! To place an order visit our website www. pvrbeef.ca or call us at 519-925-6628. Order your baby chicks, ducks or ready-to-lay pullets from Bonnie’s Chick Hatchery. Your local agent is A&D Country Market, 1619 Cty Rd 42, Stayner. Call 705-428-2465 and ask for Dwayne or Cayleigh. HELP WANTED Personal care support for an individual with brain cancer May through September weekly from Friday morning through Monday evening. Responsibilities include bathing, dressing, cooking and exercise. Location near Mansfield. Individual could be a university student with interest in health care or a PSW. Compensation consistent with experience. Please call David if interested at 416-509-6460. RENTALS One bedroom apartment on Mill Street. Downstairs. Available immediately. Call 705-466-3635. Fri. April 19: 11 a.m. Auction sale for the Estate of the late William (Willie) Weiner. Kubota B3200 – 4 WD compact w/ LA504 ldr 194 hrs; Kubota T2300 riding mower; 4’ bush hog; Agro Trend dump trailer; Cub Cadet 826C snowblower; chain saws, weedeaters; 4 stalking bookcases; furniture; 20 cord of wood. Sale held at #794610 Dufferin Cty Rd 8, Mono Centre. Elliott Painting and Decorating, over 30 years experience with excellent references. Interior and exterior painting and wallpapering. Call for free estimate at 705-466-2356. Affairs’ Friday Night Bistro. Englishstyle Fish n Chips, Homemade Burgers, roasted chicken and honey garlic ribs are on the menu. Dine in or take out until 7 p.m. 705-466-5621. Contractor Repairs, restores, dismantles and jacks up farm buildings, homes, and cottages. Also roofing, siding, doors, windows, beams, posts, foundations, peers, cement work, fencing, eaves troughing, decks, docks installed, repaired, replaced. Brian McCurdy. 519-986-1781. Do you need a caring, reliable house sitter for your home, dog or cat? Able to stay in your home for daily, overnight or weekly stays. Go away on your travels knowing your house and or pets will be well cared for with love. 705-441-1836. K. Brulotte & Sons. Excavating, grading, site clearing & landscaping. Over 20 years experience. Call for free estimate. 705-443-7815. Gayle Millsap, Cathy and Jim Lowe are pleased to announce the birth of their grandson Coleson James on Tuesday, March 26 weighing 7lb 13oz. Mom, Dad, and sister Tessa are all very proud. IN MEMORIAM SCOTT, Lyle – Sept 10, 1941 – April 12, 2010. “And when the earth shall claim your limbs, then shall you truly dance.” Missing you, Jill Hindle & family. Rod the Window Cleaner. You deserve a Clear View. Spring is here! You know you want it! Residential, commercial, year-round. All windows welcome. Call 705-351-0768. References on request. Painting, Masonry & Parging. Professional quality. Now accepting new projects. Call Don for estimate at 705-424-0708 or 705-816-0708. Chimney Sweep – Spring Cleaning. Avoid the fall rush. Call Roger at 705435-8503. WETT Cert. Core Lawn Aeration removes small cores of soil from your lawn, allowing water, oxygen, and nutrients, to reach the root system. Rate for average sized lawn is $40. To refresh your lawn, call or text Martin at 705-716-0549, or email mnwoodward23@gmail.com. Staerk Aerial - Private/Farm New pole line installs, Replacing poles, Sign installs, Tree trimming/removal, Crane work, Street lighting. Electrical 9 6 contractor - fully licensed and insured ECRA/ESA #7011953. 2 7 Call Andrew 5 for a quote 705-888-6406. Sparkling Clean House Cleaning – I 5 8staging guarantee it! Parties,1renovations, and 5 moving as well as regular cleaning. 9 Please call Sue at 519-939-8850. 4 6 1 ROBOT WALLET found. If it is yours, 7Creemore Echo 8 come to to pick up. HORTON, Kenneth David Passed away peacefully at General & Marine Hospital, Collingwood, on Friday, April 5, 2019 in his 83rd year. Ken, dearly beloved husband of Greta (nee Johnson) for 59 years. Loving father of Heather (Ross) Borthwick, Jill Horton, and Paige (John) Cowan. Cherished Grandad of Andrew, Alex and Adam Borthwick, Zachary Horton, and Luke and Charlotte Cowan. Predeceased by his parents, Harry Horton and Gwendolyn (Horton) Beazley (nee Coombes). Ken was a building supply salesman for Hamilton Brothers in Glen Huron for 33 years where he practiced his wellknown wit. His hobbies included an avid interest in photography, woodworking, and stamp collecting. He was keenly interested in Camp Simpresca, near Midland and served on its Camp Board for 14 years. Throughout his adult life Ken’s family was always his greatest love. Ken will always be remembered lovingly by family and friends. Ken was supported at home by many caring caregivers: St. Elizabeth Health; Right at Home; Carol Refflinghaus, of On My List, Senior Assist; and our dedicated private caregiver Karen Plater who assisted Ken for over five years. Visitation will be held at Chatterson Funeral Home, Collingwood, on Monday, April 15, 2019 from 2 to 5 p.m. A Celebration of Life will be held at the Centennial United Church, 234 William Street, Stayner, on Tuesday, April 16, 2019, at 11 a.m. In lieu of flowers donations may be made to Collingwood General & Marine Hospital Foundation, www.cgmhf.com, Centennial United Church, Stayner, www.ucstayner.ca, or Camp Simpresca, www.simpresca.net. Contact www.chattersonfuneralhome. com for more info. THANK YOU Huge thank you to MacDonald Construction for once again, providing the midnight equipment to clean out the ditch during the yearly spring thaw. You truly care about your neighbours and community and it shows! Lorie & Doug Awender. Celebrate Earth Day at the Simcoe County Museum. Experiment with the unseen light of the sun and learn how you can protect yourself from its powerful rays. Finish the day off by harnessing the sun’s energy to cook a delicious treat. The event is Saturday, April 20, 2019 from 1 to 4:30 p.m. Admission is by donation. All outdoor activities are weather permitting. For more information, contact the Simcoe County Museum at 705-728-3721 or visitmuseum.simcoe. ca. The museum is located at 1151 Highway 26, Minesing. The Clearview Public Libraries (Stayner, Creemore and Sunnidale) is seeking a permanent part-time Circulation Clerk. Clearview Township stretches south from the shores of Georgian Bay, in the heartland of one of Ontario’s most beautiful recreation areas; - just a 90-minute drive from Toronto and other major centers in Southern Ontario. The region has a long history as one of Ontario’s favorite tourist and vacation destinations, attracting over 2 million visitors annually. Our community offers all the modern urban amenities with the attractiveness and friendly charm of small-town quality of life. Key Accountabilities Reporting to the Library Assistant / Deputy CEO, the Circulation Clerk is responsible for performing circulation and reference duties and assist patrons with interlibrary loan requests. Qualifications: Recognized degree or diploma in Social Services / Social Work and or Recreation and Leisure with 3 to 5 years related experience including supervisory experience. In addition, Non-violent Crisis Prevention Training, current CPR “C” with AED, First Aid Certification and a valid driver’s licence are essential to this role. Responsibilities: Reporting to the General Manager Parks, Culture and Recreation, the Youth Center Coordinator participates in the development, coordination, supervision, scheduling and marketing of youth centre recreational programs and activities (for 12 to 17 years of age) and the management of the youth centre. The preferred candidate will posses a thorough knowledge of implementing, scheduling, administering and evaluating services within a Youth Center. They must be able to follow procedures with respect to recognizing youth at risk in accordance with Child and Family Services Act. Experience and proven ability creating a liaison with the Clearview Youth Center, community organizations and corporations, youth related agencies and education institutions to coordinate and promote activities. Salary: Salary range offered for this position is $54,399 to $66,120 per year plus a competitive benefits package. Note: The preferred candidate must be willing to provide consent for the Township to conduct a criminal background and vulnerable sector check prior to finalizing an employment offer. The preferred candidates will possess a certificate in Library Management. Hours of work: Varies but approximately 10-20 hours per week. The position includes mandatory evening and weekend shifts. Note: The preferred candidate must be willing to provide consent for the Township to conduct a criminal background and vulnerable sector check prior to finalizing an employment offer. Salary: Salary range offered for this position is $21.33 per hour to $25.93 per hour. We thank all applicants for their interest; however only those applicants selected for an interview will be contacted. No phone calls please. The Township of Clearview is an equal opportunity employer. We thank all applicants for their interest; however only those applicants selected for an interview will be contacted. No phone calls please. The Township of Clearview is an equal opportunity employer. Accommodation will be provided in accordance with the Accessibility for Ontarians with Disabilities Act (AODA).